Karimi, R., Ghezavati, V., Damghani, K. (2015). Optimization of multi-product, multi-period closed loop supply chain under uncertainty in product return rate: case study in Kalleh dairy company. Journal of Industrial and Systems Engineering, 8(3), 95-114. Rouhollah Karimi; Vahid Reza Ghezavati; Kaveh Khalili Damghani. "Optimization of multi-product, multi-period closed loop supply chain under uncertainty in product return rate: case study in Kalleh dairy company". 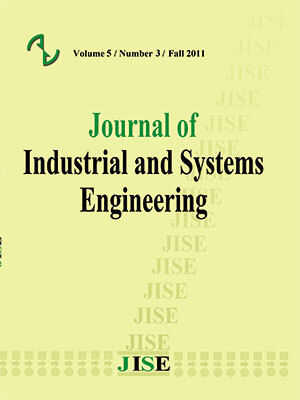 Journal of Industrial and Systems Engineering, 8, 3, 2015, 95-114. Karimi, R., Ghezavati, V., Damghani, K. (2015). 'Optimization of multi-product, multi-period closed loop supply chain under uncertainty in product return rate: case study in Kalleh dairy company', Journal of Industrial and Systems Engineering, 8(3), pp. 95-114. Karimi, R., Ghezavati, V., Damghani, K. Optimization of multi-product, multi-period closed loop supply chain under uncertainty in product return rate: case study in Kalleh dairy company. Journal of Industrial and Systems Engineering, 2015; 8(3): 95-114. Closed Loop production systems attempt to economic improvement, deliver goods to customers with the best quality, decrease in the return rate of expired material and decrease environmental pollution and energy usage. In this study, we solve a multi-product, multi-period closed loop supply chain network in Kalleh dairy company, considering the return rate under uncertainty. The objective of this paper is to develop a supply chain model including raw material suppliers, manufacturers, distributors and a recycle center for returned products. Solving this model helps us to make a good decision about providing materials, production, distribution and recovery. Our basic goal is to estimate optimum return rate of some products such as yoghurt, to production cycle. Once the products pass 􀬷 􀬸 of their shelf life, they are returned to production cycle. For this study, we develop a linear programming model with a consideration of chance constraints. Finally, this model is implemented by Lingo software with using real data. The obtained results by our model show 9.5 % decrease for total cost in comparison with the current status. Ahumada, O., & Villalobos, J. R. (2011). A tactical model for planning the production and distribution of fresh produce.Annals of Operations Research, 190(1), 339-358. Akkerman, R., Farahani, P., & Grunow, M. (2010). Quality, safety and sustainability in food distribution: a review of quantitative operations management approaches and challenges.Or Spectrum , 32(4), 863-904. Amorim, P., Günther, H. O., & Almada-Lobo, B. (2012). Multi-objective integrated production and distribution planning of perishable products. International Journal of Production Economics, 138(1), 89-101. A.I. Barros, R. Dekker, V. Scholten, A two-level network for recycling sand: a case study,European Journal of Operational Research . 110 (1998) 199–214. Fleischmann, M. (2001). Quantitative models for reverse logistics. Lecture Notes in Economics nd Mathematical Systems , 501. Fleischmann, M., Beullens, P., Bloemhof-Ruwaard, J. M., & Van Wassenhove, L. N. (2001). The impact of product recovery on logistics network design. Production and Operations Management, 10(2), 156–173. Fleischmann M, Jacqueline MB-R, Rommert D, Erwin van der Laan JAEE, van Nunen, Van Wassenhove LN. Quantitative models for reverse logistics: a review. European Journal of Operational Research 1997;16:1–17. Guide, V. D. R., Jr., & Van Wassenhove, L. N. (2009). The evolution of closed loop supply chain research. Hassanzadeh Amin, S., and Guoqing Zhang;(2012); An integrated model for closed loop supply chain configuration and supplier selection: Multi-objective approach, Expert Systems with Applications 39 (2012) 6782–6791. Ko, H. J., & Evans, G. W. (2007). A genetic algorithm-based heuristic for the dynamic integrated forward/reverse logistics network for 3PLs. Computers & Operations Research, 34(2), 346–366. Jayaraman, V., Guide, V. D. R., Jr., & Srivastava, R. (1999). A closed loop logistics model for remanufacturing. Journal of the Operational Research Society, 50(5), 497–508. H.R. Krikke, A. Van Harten, P.C. Schuur, Reverse logistic network re-design for copiers, OR Spektrum 21 (1999) 381–409. D.H. Lee, M. Dong, A heuristic approach to logistics network design for end-of-lease computer products recovery, Transport. Res. Part E: Logist. Transport. Rev. 44 (3) (2008) 455–474. of remanufacturing activities, Computers & Operations Research. 34 (2) (2007) 299–323. Melo, M. T., Nickel, S., & Saldanha-da-Gama, F. (2009). Facility location and supply chain management – A review.European Journal of Operational Research, 196(2), 401–412. H. Min, H.J. Ko, B.I. Park, A Lagrangian relaxation heuristic for solving the multi-echelon, multi-commodity, closed loop supply chain network design problem, Int. J. Logist. Syst. Manage. 1 (4) (2005) 382–404. Nagurney, A., Dong, J., (2002). Super networks: Decision-Making for the Information Age.Edward Elgar Publishing, Chelthenham, England . Mir Saman Pishvaee, Masoud Rabbani, Seyed Ali Torabi,A robust optimization approach to closed loop supply chain network design under uncertainty,Applied Mathematical Modelling. 35 (2011) 637–649. Rajkumar, M., Sivakumar, B., and Arivarignan, G., (2011), Continuous Review Perishable Inventory System with One Supplier, One Retailer and Positive Lead Time,Journal of Industrial and Systems Engineering 5 (2), Page 80-106. Rogers, D. S., & Tibben-Lembke, R. S. (1999). Going backwards: Reverse logistics trends and practices. Pittsburgh, PA: RLEC Press. Rong, A., Akkerman, R., & Grunow, M. (2011). An optimization approach for managing fresh food quality throughout the supply chain.International Journal of Production Economics,131(1), 421-429. F. Schultmann, B. Engels, O. Rentz, Closed loop supply chains for spent batteries,Interfaces, 33 (2003) 57–71. Shi, J., Zhang, G., & Sha, J. (2011). Optimal production planning for a multi-product closed loop system with uncertain demand and return.Computers and Operations Research, 38(3), 641–650. Tan, B., & Çömden, N. (2012). Agricultural planning of annual plants under demand, maturation,harvest, and yield risk.European Journal of Operational Research, 220(2), 539-549. Yu, M., & Nagurney, A. (2013). Competitive food supply chain networks with application to fresh produce. European Journal of Operational Research, 224(2), 273-282.